"We believe it is our calling to honor the human-animal bond. This drives us to provide progressive medical care with compassion, competence, and professionalism. We will love your pet as if they were our own, because they deserve nothing less." Dr. Justina Miles grew up on Verona Island, Maine and attended school in Bucksport where she participated in sports and drama. She then moved to Michigan to attend college and graduated from Michigan State University with a Bachelor's degree in Zoology. She loved being a Spartan and they were gracious enough to let her stay at Michigan State Univiersity and attend Veterinary School receiving her DVM in May of 2005. 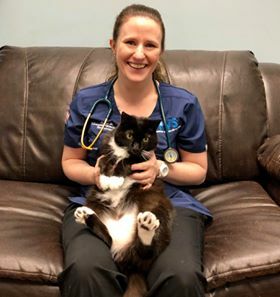 After graduation, Tina returned to her home state of Maine and worked as a mixed animal practitioner for one and a half years before purchasing Penobscot Veterinary Services in October of 2006. Tina's professional interests include surgery, orthopedics and internal medicine. When she isn't taking care of her patients, she enjoys hiking, gardening, skiing, and watching Michigan State Spartans win. She shares her home in Dover Foxcroft with her husband, two daughters, a goofy Great Dane, 2 cats and 5 Quarter Horses. Dr. Diana Thomas grew up on Prince Edward Island. 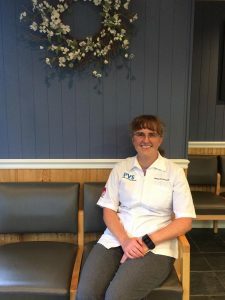 Following in her father's footsteps she pursued a career in Veterinary Medicine, earning her DVM degree in 1998 from Atlantic Veterinary College , PEI. 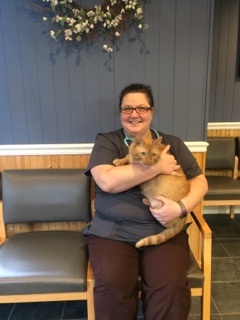 After graduation she joined the professional staff at Penobscot Veterinary Service. Diana has a special interest in Ultrasound. Dr. Beckett joined the team at PVS as a veterinarian in May 2015, but you may remember him from his time working here as a licensed technician before attending vet school. He received his Doctor of Veterinary Medicine from Iowa State University College of Veterinary Medicine in 2014 after attending the University of Maine Augusta, Bangor Campus and gaining his Associate of Science in Veterinary Technology. Before rejoining the PVS family, he spent his first year in practice working as an associate veterinarian in southern Maine. A Maine native, he grew up in Robbinston and now owns a horse farm in Exeter with his wife which they share with their 2 dogs, 4 cats, and 4 horses. In his free time he enjoys hiking, kayaking, and running. Our veterinary team includes 4 veterinarians, a management team, veterinary technicians, veterinary assistants, customer service representatives, and an animal care attendant. We offer the highest standards and each staff member is dedicated to providing the absolute best care for your pet. Because your pet deserves nothing less! Tiffany joined the PVS staff in October 2004. She is a graduate of the University of Maine with a BS in Animal and Veterinary Science. She has a feline housemate-Chase, a Border Collie-Piper, a Long Haired Chihuahua-Tansy, and a Yorkshire Terrier - Tootsie. Tiffany and Piper are very active in many dog sports and competitions. They primarily compete in CPE agility and are part of the Eastern Maine Agility Club. When they aren't playing agility, they attend Rally competitions, earn Trick Dog titles, and have even started to work on their very own freestyle routine! Tansy had an early retirement from agility because she just didn't like it. She has since become a Therapy Dogs International (TDI) certified therapy dog. When Tansy is not cheerleading for her big sis Piper, she and Tiffany go to the library in their hometown to participate in the reading buddy program. The reading buddy program really helps children improve their reading skills in a no judgement atmosphere. Tansy loves listening to children read! Tansy also spreads joy visiting nursing homes, hospitals, and visiting the students at UMaine during finals week. Tootsie is a real firecracker! She joined Tiffany's family after a brief time as a foster care pet who was just too sassy to let go. Foster failure! She had initially been released to PVS due to severe orthopedic problems. Under the care of Dr. Miles, Tootsie was the recipient of two hip (FHO) surgeries followed by a period of recovery with Dr. Leighton and regular physical therapy sessions. After a rough start, Tootsie is on her way to tearing up the agility field! "To the world you are one person, but to your dog, you are the wold." Rachel joined the PVS family in the spring of 2008. She is a 2007 graduate of the University of Maine’s School of Social Work with a Masters Degree in Social Work. Her previous work involved human health promotion and substance abuse prevention. Her love for prevention and health promotion has traveled with her to PVS for sure! Rachel and her husband, Eric, share their home with 4 cats - BoSox, Lucy, Nutmeg & Hugo James. We consider Rachel our “crazy cat lady”. She has completely taken feline indoor enrichment to heart and, with lots of Eric’s help, “catified” their home. Their cats enjoy a couple of cat trees, a climbing wall, feeding puzzles, Feliway diffusers, lots of litterboxes, along with many shelves and beds along the walls for the cats to explore. Cats are near and dear to Rachel’s heart and she has a soft spot for dilute calicos and scaredy cats. Rachel also shares her home with two canine companions, Jade, a lab/hound mix, and Cameo, a standard poodle. Both dogs were adopted from the Bangor Humane Society. When Jade and Cameo were younger pups, they attended many training classes. Now senior pets, they still enjoy an occasional run around their backyard agility course, but mostly they spend their time living the good life, sleeping on the couch and snuggling with their best friend, Nutmeg. Rachel has 2 Standardbred horses - Billie & Jessa. The horses are also UMaine graduates! As young mares, they were part of the University of Maine Standardbred retraining program. Somehow they ended up coming home with Rachel and Eric. Spending most of their time now as pasture ponies, Billie and Jessa love to go for a light ride to stretch their legs and kick up their heels! Last but not least, Rachel and Eric are soon expecting their first 2 legged child. Due the end of December 2015, they are thrilled to be adding a human child to their family and hope to pass on a love for running, music, art, and for all creatures, great and small! Anika joined PVS in the fall of 2011 as a full-time Client Service Representative. She now splits her time here between helping clients at the front desk and as a Veterinary Assistant during office calls. Anika has a background working with shelter animals and previously worked at another veterinary practice in the southern part of the state. She shares her home with her husband, son, two dogs and cats. Michelle joined our PVS family in January of 2014 as a half-time Veterinary Assistant and half-time Client Service Representative. She grew up in Auburn, Maine and attended Edward Little High School and Framingham State. Michelle has a background in customer service as a bank teller and client service representative. She has also worked with shelter animals as a shelter technician and volunteered as a dog walker. Her special interests at PVS include "all the gross things Charles has in the lab." She enjoys knitting, gardening, and dog training. She shares her home with her husband and their dog: Gracie; cats: Stella & Aldo; and a guinea pig named Ellsworth. ​Megan has​ ​​been with the team, off and on, since 2007. She started here in high school as an animal care attendant and has worked her way up to being one of our CSR/VAs(client service rep/veterinary assistants)! She got into this field of work for her love for animals and animal sciences. She enjoys horseback riding, taekwondo and working on her farm in her spare time! She has a passion for adopting cats that are deemed unadoptable and giving them homes in her barn. She, quite literally, has a farm at home! :) She has three dogs, Niklaus, Nova and Willow – three house cats, Nieve, Nigel and Norwood AKA Sketchy – many barn cats/rat assassins, some of which include Murda-Murda, Stiches, Dee, Double Dee, Sunshine Suzie, Gansta Gary and Siren – two goats, Hans and Frans…along with many other farm animals! ​Mariah is​ one of our CSR/VAs (Client Service Rep/Veterinary Assistants) She got into this field for her lifelong love of animals and a passion for improving their well-being. She has enjoyed expanding her canine handling knowledge here by becoming Fear Free certified. She enjoys being a foster mom in her spare time - especially for Mama kitties and senior dogs. She has three dogs at home - Zeyda, Linus and Arya. As well as seven cats - Gryff, Michelangelo, Hank, Chantry, Hammond, Ellie and Hiccup. ​Cassie is​ one of our CSR/VAs (Client Service Rep/Veterinary Assistants) She got into this field because she enjoys the challenge of having patients that can't talk and tell us exactly what's wrong. She's also a student at UMaine studying Animal Sciences with a focus on Pre-Vet! She enjoys playing field hockey or relaxing at her family camp in her spare time. She has two pets of her own - one dog, Alice and one cat, Max. Kristina joined the PVS team in May of 2013 as a Client Service Representative. Kristina is a "Beauty School Dropout" and a certified CRMA. In 2008 she volunteered at the Nonviolence as a Way of Life Conference in Eugene, Oregon. She has experience working with people in a number of different settings: telemarketing, as line cook, a dietary aide, in the craft department, with adults with developmental & cognitive disabilities, factory line assembly, as a waitress and at a cleaning service. Kristina really enjoys interacting with clients at PVS. Outside of her work at PVS, Kristina enjoys abstract art, abstract crafts, music, snowmobiling, gardening, and many other outdoor activities. Kerri joined the PVS staff in August of 2009. Her hometown is Lee, Maine. She graduated from Central Maine Community College in 2009 with an A.S. in Business Administration & Computer Applications. While Kerri worked at Hannaford and Home Depot, a long time ago, PVS is her first job! We are so lucky to have found her! Kerri is a regular volunteer with our team for fundraising events like Paws on Parade and BARK for Life. She enjoys fundraising and is in charge of keeping our client education handouts well stocked and organized. She is married to her high school sweetheart, Jason. They share their home with their daughter, Kammi, and their three kitties: Walter, Denny & Si. She enjoys cooking, sports such as basketball and softball, going to camp, hunting, fishing and spending time with family and friends. 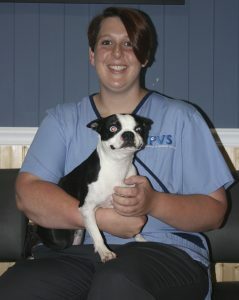 Nicole joined the PVS family in 2001 after earning her degree and license in Veterinary Technology. She has special interests in surgery, physical rehabilitation and animal behavior. She lives in Bradford with her husband, David. She spends the winter reading, but enjoys working in her flower garden once the world warms. She is also active in the EMAC dog agility club. Nicole has been adopted by four mixed breed dogs who have graciously agreed to be her agility partners. Sander is an old guy who has been her best friend since he was nine weeks old. He has taught her more about canine behavior than ten books could. Lo is a small dog with a huge heart. Despite life long health problems, she has an unsurpassable joy of life that infects the entire family. Choodle is a chihuahua/poodle mix who wormed her way into our home with her signature "paws in the air" dance. She may weigh just five pounds, but she totally rules her life and everyone else's. And the newest addition is Lucien, a chihuahua/poodle mix. Nicole and David also share there life with three cats, Maceo, Finley and Steely. The three boys were all adopted when they came into the hospital as strays. Born and raised on a farm/ranch in Colorado, Charles served in the U.S. Navy after H.S. and then spent the next 10 years as a carpenter. First licensed in 1995, he spent his first 11 years as a tech at a busy 4 doctor practice where he became interested in and proficient at cytology and has recently volunteered some of his time to teach cytology to the students in the local Vet Tech program here at the University College in Bangor. A busy father of 5 children, Charles has three cats, a boston terrier, and a goldendoodle. He continually uses his carpentry skills to make improvements around the clinic and would like to further sharpen his skills in the field of cytology. Renee graduated from the University of Maine at Augusta in 2012 with a B.S. 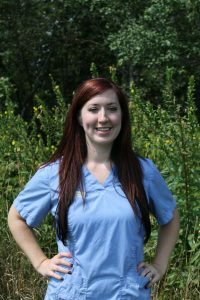 in Veterinary Technology in 2012 and is a licensed veterinary technician. Renee currently has one cat, a three-legged rescue, who she named Drei, which is German for “three”. When not at work, Renee can't get enough of her family and friends. Whether it be playing card/board games, watching movies, or just sitting together talking and laughing, family is her favorite past-time. Renee takes delight in art and music and being outdoors. She also dabbles in sewing and is teaching herself how to knit. ​Erin​ graduated from the University of Maine at Augusta with a B.S. in Veterinary Technology in 2017 and is a licensed veterinary technician. She got into this field for her love of animals and being drawn to helping those in need - animal medicine is that perfect combination. She loves to spend time with her family - exploring/hiking new places and going to concerts. She also enjoys reading, painting and soap making in her spare time! She has three dogs - Ezra, Winston and Mae, four cats - Sebastian, Bill, LeRoy and BaoBao, four ferrets - Sage, Yarrow, Patchouli and Juniper, three ducks - Drake, Ginger and Dahlia, and one turtle - Clover! Megan S. joined the PVS staff in July 2009. She has two kids, Fae and Myka. Megan also has one dog: a bullmastiff, Eleanor and two cats: Flour and Stanley. Megan resides in Lincoln with her fiancé and family. When Megan isn’t busy working at PVS, she loves spending time with her friends and family. Kim grew up in New Hampshire near Rochester and moved to Maine in 2009. She grew up with animals her entire life and decided to go into Veterinary medicine because of her love for animals. She graduated from UCB in 2016 and shortly after became a Licensed Veterinary Technician. She has one son named Keagan and lives with her boyfriend named Anthony. She has three dogs named Meegan a Lab mix, and 2 Dachshunds Chanel (she’s had Chanel for 14 years and she rules the house!) and Emma the newest edition to the household. Her favorite breed is Dachshunds especially long-haired ones. She has one cat named Smokey Jo who was her Grandmother’s. Kim’s professional interest is doing dentals and she believes dental hygiene is very important. Outside of work her interests are hiking, 4-wheeling, going for walks with her dogs and family, and has loved working on cars with her Dad since she was 12. Julie joined PVS in 2002. She and her husband David are parents of 2 grown children, 3 dogs, 4 cats, 4 horses, cows and chickens. They enjoy riding ATV’s, snowmobiles, horseback riding, farming, working in their garden, and spending time with their grandchildren. Onyx also known as "Black cat" or "Trouble" arrived at PVS in the summer of 2006. She came to us with a bum leg and won the hearts of the staff. She now lives out her life behind the scenes of PVS. She has saved many other cats lives by being a blood donor allowing us to give blood transfusions. She is a big part of PVS and always will be!! Max joined our mascot staff the summer of 2011. He is a mischief maker who enjoys meeting and greeting staff, patients and clients. He is forever trying to make his way to the front of the hospital to socialize! Max helps show our clients how to medicate a cat and how to give kitty nail trims. He is always ready to sit on our laps or play with his best buddy, Onyx!